Best AVI joiner to join multiple AVI files into a new one at a time with original quality on PC/Mac. This article mainly discusses about how to use a professional reliable AVI joiner program to fast join AVI files with original quality. To some extent, this recommended AVI joining software is a combination of AVI joiner, AVI cutter and splitter, AVI editor, AVI converter, enabling you to join multiple AVI video files into a large AVI file or other different video formats you prefer. It also acts as a MP4, WMV, MOV, MPEG, FLV, etc. video joiner. First-rated AVI joiner to quickly join AVI files without any quality loss. Use it to join 2 AVI files or batch merge multiple AVI clips into a bigger one with perfect result. 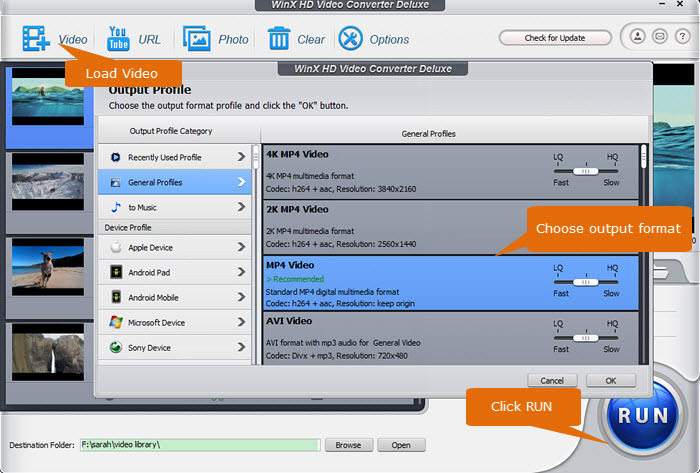 WinX HD Video Converter Deluxe can do the following with no hassle. -	Edit video: Cut, crop, rotate, flip, merge video. Add watermark/subtitles to video. Adjust video/audio settings. As for joining 2 AVI files into one or combining multiple videos into one larger file, WinX HD Video Converter Deluxe is highly recommended for you. This professional all-in-one video joiner, video editor and video converter allows users to join more than two video files into one and keep the original quality. You can add several (AVI) video files at a time and merge them into a new single file as AVI, MP4, WMV, FLV, MOV, H.264 or other formats at No.1 fast speed thanks to its multi-core CPU and hardware acceleration technologies including world's most advanced Intel QSV, Nvidia CUDA/NVENC, AMD, etc. 1. Before joining AVI files, this video merger lets you freely customize the video audio parameters like video audio codec, frame rate, resolution, bit rate, aspect ratio, etc. 2. This top video editor allows users to add subtitles/effect/watermark, crop or expand video, trim/cut video/split video to get a desired part to merge with this all-round video joiner and cutter. 3. Join more than one video file into one and convert the video to preferred format/device, like convert AVI to MP4, FLV, MOV, iPhone (X), iPad Air/Pro/Mini, Android Samsung Galaxy S9, HTC, and 410+ preset profiles. 4. This powerful AVI joining software also allows you to batch download any video/movie/music from YouTube, Dailymotion and 300+ sites and convert them to AVI file or other. Before starting to merge AVI files into one, you can first free download and install WinX HD Video Converter Deluxe on your PC (Windows 10 included) or Mac (Mojave or lower), and then follow the simple steps below to join multiple AVI files together with ease. Step 1: Add the AVI files into the AVI joiner program. Launch the AVI combining software and click "Video" button. Then click "+ Video" button on the top-left to import the original AVI files you want to merge, or just find and drag the videos into the main interface. You can batch select and add several videos at a time. Click the Cross icon to delete any unwanted file or click "Clear" button on the top tool bar to delete all added files once. Step 2: Set AVI or other desired format as the output profile. In the Target Format window, choose any output format you want the joined video to be and click "OK". WinX HD Video Converter Deluxe provides you 370+ built-in video & audio codecs and 410+ preloaded profiles for you to choose. Editing the video is also accessible. Step 3: Merge multiple AVI files into one. After all settled down, remember to tick "Merge" button. Set a destination folder to store the joined AVI file and hit "RUN" to start the AVI video joining task. Seconds or minutes later, you'll get a new AVI file with original quality. All-in-one AVI joiner to join AVI files into one with original quality; merge and convert any 8K/4K/HD/SD videos in various formats to AVI, MP4, WMV, MOV, FLV; iPhone, iPad, Android, etc; download any movie/video/music from YouTube and 300+ sites, convert DVD to MP4 or any format/device; record computer screen, record webcam, etc.